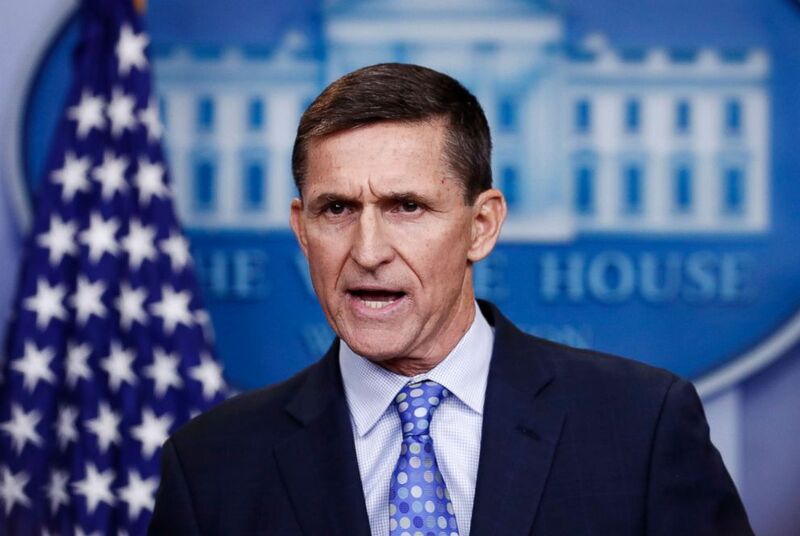 The federal judge in retired Army Lt. Gen. Michael Flynn's case has ordered that documents related to Flynn's 2017 FBI interview be turned over by the government for his review, just days before Flynn is scheduled to be sentenced for lying to the FBI. And the order comes as President Donald Trump and Flynn’s supporters have escalated their arguments that Flynn was pressured or tricked into lying. The documents concern an interview between Flynn and two FBI agents at the White House in January 2017. In December 2017, Flynn pleaded guilty to lying to the FBI during the interview about contacts he had with Russia's ambassador to the U.S., Sergey Kislyak, during the presidential transition -- from election day 2016 until President Donald Trump's inauguration. Flynn, who became Trump’s national security adviser before he resigned in February 2017, has been cooperating with investigators since, though most of his 19 interviews with the special counsel team occurred early this year, a source close to Flynn has told ABC News. It wasn't immediately clear why U.S. District Court Judge Emmet Sullivan has ordered the FBI interview report – or “302” form -- be shown to him. But one Republican lawyer surmised that the judge -- who replaced another judge shortly after Flynn pleaded guilty a year ago -- was concerned by allegations made by Flynn's defense lawyer that the FBI misled Flynn about what he thought was an informal meeting with the agents at the White House. “They’re not changing the admission that he was lying, but they are saying there are mitigating factors,” Solomon Wisenberg, who served as deputy independent counsel in the Ken Starr investigation of President Clinton, told ABC News Thursday. It did not appear to be a move by Flynn’s lawyer to get the conviction tossed out, he added. “It’s reputation management,” Wisenberg speculated. "It's his lawyer's last chance to say there are mitigating circumstances." 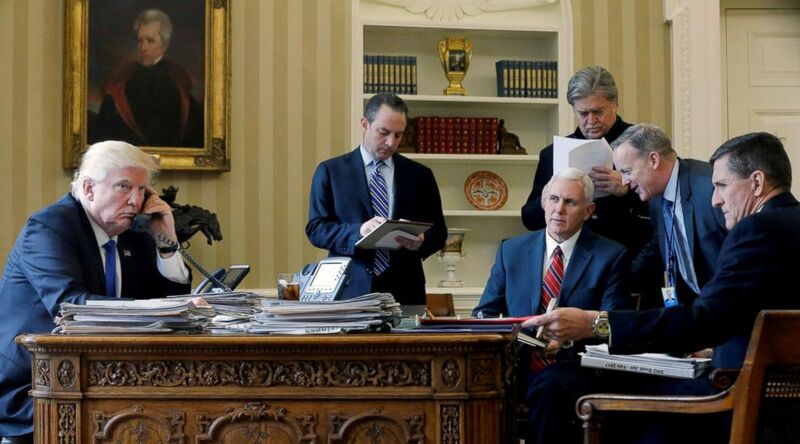 President Donald Trump, joined by Chief of Staff Reince Priebus, Vice President Mike Pence, Senior Advisor Steve Bannon, Communications Director Sean Spicer and National Security Advisor Michael Flynn, speaks with President Vladimir Putin, Jan. 28, 2017. Prosecutors with special counsel Robert Mueller recommended in a filing that Flynn receive no prison time in exchange for they called his "significant" cooperation with the ongoing investigation into Russian interference in the 2016 election. Flynn's legal team responded to the special counsel's filing Tuesday by echoing calls for leniency in Flynn's sentencing. However, Flynn's defense team also offered more information on the meeting in which Flynn has admitted he lied to the FBI. According to their filing, Flynn was not warned of the consequences of lying to the agents before his interview. The filing said that the agents were concerned that warning Flynn "might adversely affect the rapport." In the defense's explanation of the meeting, the filing references in a footnote the documents now being requested by the judge. President Trump tweeted about Flynn on Thursday, alleging that the special counsel had recommended a lighter sentence because prosecutors were "embarrassed" by the way Flynn was treated. "The FBI said he didn’t lie and they overrode the FBI," Trump tweeted. "They want to scare everybody into making up stories that are not true by catching them in the smallest of misstatements. Sad!......" Flynn's supporters have long insisted he didn't lie to the FBI agents, who included Peter Strozk, a senior agent later dismissed because of embarrasing texts he exchanged with now-former FBI lawyer Lisa Page. The meeting with Flynn in the White House was set up by then-FBI Deputy Director Andy McCabe, who served as the agency’s acting director after James Comey was fired by Trump as FBI director in May 2017. McCabe was fired himself this year by then-Attorney General Jeff Sessions after Trump repeatedly complained about McCabe. Flynn's lawyer noted the firings in his sentencing memo. Last year, however, Trump seemed to admit knowledge of Flynn's lies in a tweet that read, "I had to fire General Flynn because he lied to the Vice President and the FBI. He has pled guilty to those lies. It is a shame because his actions during the transition were lawful. There was nothing to hide!" The judge has not, as of now, altered Flynn's sentencing date in light of his request for documents. The government has until Friday at 3 p.m. to submit the requested documents to the judge and to respond to the recent defense filing.